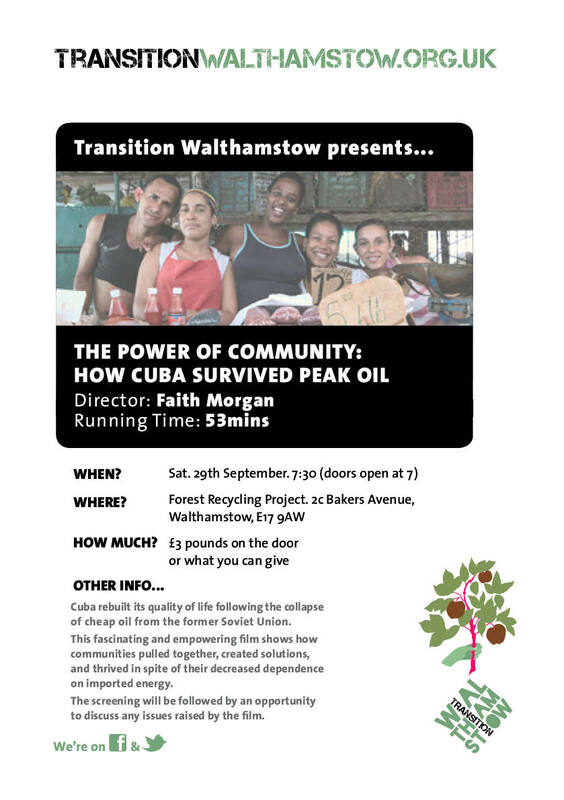 On Saturday 29th September Transition Walthamstow is screening the film “The Power of Community – How Cuba Survived Peak Oil”. The screening will be followed by an opportunity to discuss any issues raised by the film. The film is being shown at Forest Recycling Project (next door to Hornbeam) at 2c Bakers Avenue, Walthamstow, E17 9AW. Doors open at 7pm, film starts at 7.30pm. £3 pounds on the door or what you can give. This entry was posted in event, film. Bookmark the permalink.